Police are scrambling for answers after releasing their only suspects in the Gatwick Airport drone mystery. BRITISH POLICE ARE scrambling for answers after releasing their only suspects in the London Gatwick Airport drone mystery that brought Christmas getaway flights to a standstill. 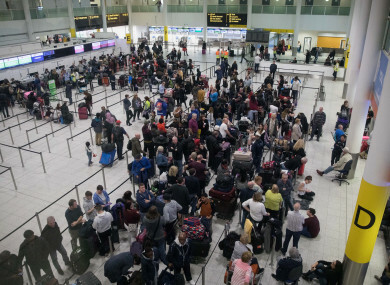 Nearly 140,000 passengers were affected over three days of disruption Wednesday through Friday as Britain’s second-busiest airport shut down because of repeated reports of drone sightings. Police arrested a 47-year-old man and a 54-year-old woman from the town of Crawley, near Gatwick, on Friday after a tip-off but released them without charge yesterday. “Both people have fully cooperated with our enquiries and I am satisfied that they are no longer suspects in the drone incidents at Gatwick,” said Sussex Police detective chief superintendent Jason Tingley. “We are not back to square one,” he said, adding that officers were looking at “persons of interest”. The airport has offered a £50,000 (€56,000) reward for information leading to the arrest and conviction of those responsible for the disruption. Tingley said the two arrests came after a tip-off from a member of the public, adding that he appreciated the released pair’s cooperation in the investigation. Under recently introduced laws in Britain, drones cannot be flown near aircraft or within a kilometre of an airport, or at an altitude of over 120 metres. Gatwick, around 50 kilometre south of London, is Europe’s eighth-busiest airport. Gatwick’s website said its runway was open and it aimed to run a full schedule, but passengers were warned to expect some delays and cancellations. The UK Labour Party has called for an independent inquiry after accusing the government of failing to act on the risks posed by drones. But a Department for Transport spokesman dismissed claims of missed opportunities to prevent the Gatwick incident as “a combination of nonsense and gross misrepresentation”. Email “Police admit there is a possibility that no drones hovered over Gatwick Airport”. Feedback on “Police admit there is a possibility that no drones hovered over Gatwick Airport”.